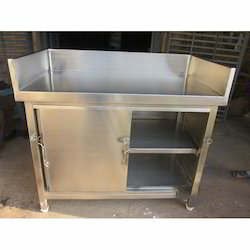 Providing you the best range of Stainless Steel Tables such as Under Shelves Table and Dish Landing Table with effective & timely delivery. Since our commencement, our firm is engaged to introduce a premium quality array of Under Shelves Table. The offered table is developed in accordance to industry norms and quality parameters. In the offered table, our professionals use the approved stainless steel material during the manufacturing process. In addition, this table can be built and developed according to the specification provided by the clients. Furthermore, our professionals opt for strict quality inspection made on the table to ensure high performance. Details: Tables With Under Shelves 3 Side Cover & Slash Back. 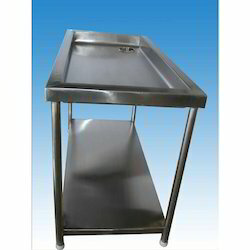 As a trust worthy organization of this domain, we are committed to offer our clients a superior quality assortment of Dish Landing Table. This table is developed using quality stainless steel material and higher technologies. Our professionals opt for strict quality tests throughout the production of the table to guarantee optimum performance. The provided table is made accessible in different capacities. Provided table is built for heavy operations. Besides, clients can get the table from us at industry leading rates. Looking for Stainless Steel Tables ?